One-man band Nargaroth has been around for a while, debuting in 1998. 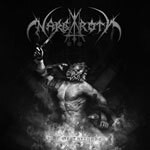 On its seventh album (and first one in eight years), Nargaroth displays a somewhat stereotypical one-man black metal band sound. 'Era of Threnody' is a direct descent of Burzum with extra everything, thus putting emphasis on the atmosphere. This album strives to hit all kinds of emotional cylinders at once. The fairly formulaic second generation black metal riffs and screams are topped with excess solemn piano passages, spoken word sections, and other different, well, sounds. All seemingly there to create an atmosphere of agony and solitude. The problem is, it does not do the job. Far from it. Most individual parts added on top of the standard black metal structures are boring at best and embarrassing at worst. For instance, the spoken intro to opener 'Dawn of Epiphany' sounds like one of those 'thought-provoking' philosophical quotes frequently circulating on social media. These usually make me vomit slightly in my mouth and bring all but an actual epiphany. The lyrics in general then follow pretty much in the same footsteps, for over an hour. Experiencing 'Era of Threnody' might have been slightly enjoyable had the more conventional black metal parts of the songs been memorable. Now, this album is mostly a bunch of second rate black metal tunes swarming with uninspiring passages attempting to be atmospheric. The black metal bands who actually conjures true feelings of despair (e.g. Grift) and loneliness (e.g. Winterfylleth) gets the job done by far less means. This album, however, is a prime example of a try-hard failing badly. Only on two occasions is 'Era of Threnody' thoroughly enjoyable. The middle section of opener 'Dawn of Epiphany' is catchy, sports a very nice riff, and actually raised some hope for the rest of the album. The other part is the entire song 'Conjunction Underneath the Alpha'. Here, Nargaroth manages to do just about everything right and is pretty much an antithesis to the rest of the album. This song could have been pulled straight from any of the last two albums by Winterfylleth. These one and a half songs, along with the all through decent black metal screams by Ash, are the only things that save 'Era of Threnody' from becoming a total disaster.